The city motto is "A Town That Cares" and is located approximately 20 minutes south of Iowa City. The population, according to the 2017 census, is 1,419. Wellman is part of the Mid-Prairie Community School District. Wellman is named for Joseph Edward Wellman. In 1879 Joseph donated 40 acres of his farmland for railroad construction. 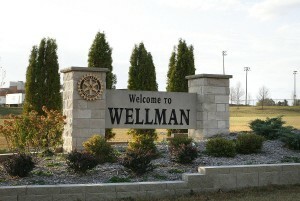 The City of Wellman was incorporated in 1885 and the water system was complete in 1896.